An Art & Craft in Integral Education programme was conducted with 30 Master Resource Persons associated with the Directorate of School Education (DSE), Puducherry. The session was held at District Institute of Education and Training (DIET), Puducherry, on October 12, 2018. 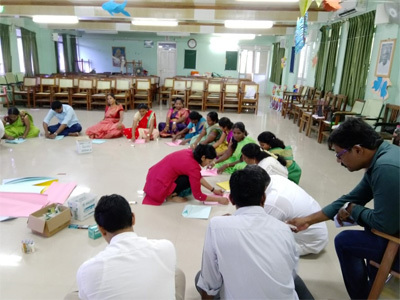 The programme was facilitated by Art in Education Enthusiasts Kiran and Hrishikesh focusing on the holistic growth of a child via Art & Craft. The session started with indoor games which can help develop concentration, awareness, alertness, coordination, and so on, in a child. 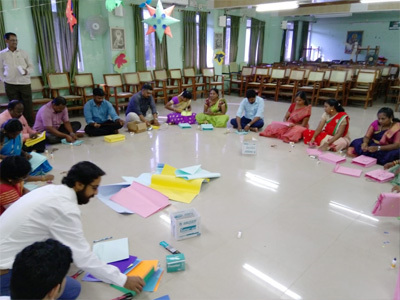 There were discussions on the need and applicability of Art & Craft in Education, which was followed by exploring the process by learning to do one paper-craft for daily use in order to cut down the use of plastic. 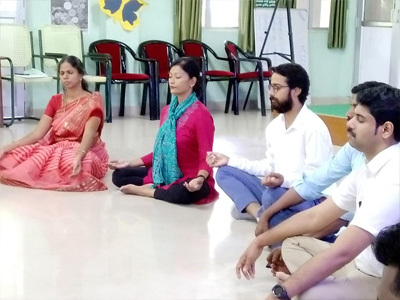 During reflection, participants realized that these activities could help promote a sense of beauty in everyday life and our environment and how they could work on the body, mind and emotions of a child.